Some of our patients complain of a “gummy” smile which can make their teeth look short and unsightly. 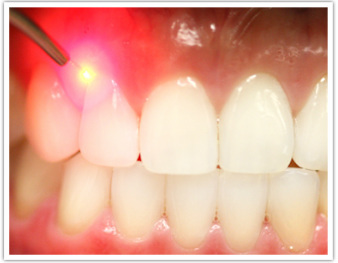 This aesthetic compromise can be quickly and painlessly corrected to create a more appealing smile with a laser! Laser technology allows us to quickly sculpt the gum line while also sealing the tissue at the same time so the patient heals faster and much more comfortably. This procedure can be painlessly completed in just one office visit.